When an investor retires, their relationship with their primary financial advisor often changes. They may require fewer services, they may require different services, or they may no long require their services at all. All of those statements are true even when the retiree is worth $25 million or more. While they usually get financial advice from someone, it is sometimes not from a financial advisor, because they do not have a professional relationship with a financial advisor. Spectrem’s bi-annual report on investors with a net worth of $25 million or more - The Wealthiest Americans - includes the revealing detail that most investors in that wealth range do not retire, or have not yet retired. Only 17 percent of those investors are retired and 13 percent consider themselves semi-retired, whatever that means. And the ones who have retired or semi-retired are the less wealthy of the wealthiest investors: approximately 80 percent of investors with a net worth $125 million say they are still working. Eleven percent of working $25 million plus investors claim they are never going to retire. Does retirement change an investor? All of Spectrem’s research shows that there are differences in attitude and behavior between investors who are retired and those who are working, and those differences extend to nearly every topic that comes up in terms of investing and finance, even when those investors are extremely wealthy. Among the $25 million plus investor population, retired investors are more likely to have a financial advisor than working investors. Seventy-one percent of those retired investors have an advisor compared to just 59 percent of the investors who have not yet retired. The higher percentage indicates that retired wealthy investors have a greater need for advice, although that advice may lean toward estate planning or wealth transfer than to portfolio growth. 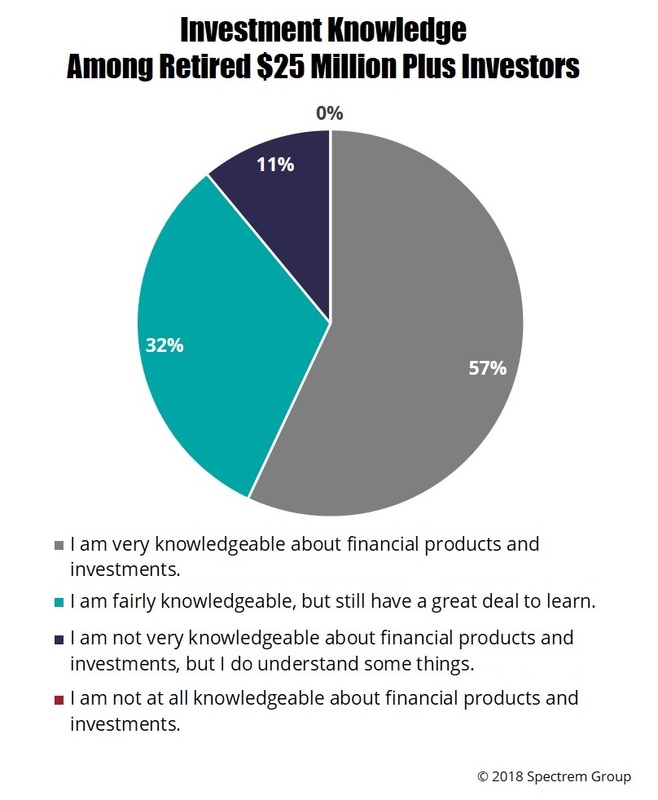 Among those retired $25 million plus investors who have a financial advisor, one-third use a Full-Service Broker as their primary advisor and 20 percent use an Independent Investment Advisor. That’s more than half the market for retired wealthy investors. They are much less likely than working investors to use an Investment Manager or a Family (or Multi-Family) Office as their primary advisor. It also seems likely that upon retirement, wealthy investors consolidate their accounts. Sixty-eight percent of retired investors who have a financial advisor have either one or two. Among working $25 million plus investors, 31 percent have at least five advisors, again indicating that upon retirement, wealthy investors de-complicate their portfolios. Despite the greater likelihood of having a financial advisor, retired investors tend to control a greater portion of their investable assets and determine how those assets will be invested. Retired investors maintain complete control of 62 percent of their assets themselves, consult with an advisor on 28 percent of assets and turn over only 10 percent to the control of the advisor. And what about Robo-advisors? The original design of Robo-advisors was to appeal to young investors with straightforward portfolios, and retired investors do tend to have less convoluted investment products. But the appeal of Robo-advisors among $25 million plus retired investors, placed on a 100-point scale, rated at only 25.86, which is very low. The required functions of financial advisors does seem to change when an investor retires, even when that investor is extremely wealthy. The Wealthiest Americans demonstrates some of the changes that occur between a wealthy investor’s working life and retired life, and advisors can note those changes and prepare accordingly.